ROW's adventure cruises on the Nile are classic trips that explore the history and rich culture of Egypt with our own private Egyptologist. You'll spend five days cruising the Nile, visiting many of the classic sites and discovering some lesser known treasures. 13-day adventure cruises depart October and February to coincide with the "Miracle of the Sun" at the temples of Abu Simbel. ROW has two variations of a classic adventure cruise trip that highlights ancient and modern Egypt. Overall trip itineraries are similar, but we offer the choice between a traditional large cruise ship and a smaller, historic two-masted yacht that carries just 10-12 passengers. The smaller yacht size gives a more intimate experience and grants us access to some of the more hidden sites along the Nile. Regardless of the vessel, each Nile cruise is led by ROW's private Egyptologist for an in-depth exploration of the country and its rich culture. Starting in Cairo, you visit the pyramids at Giza, the Egyptian Museum and many other historic sites within the capital city. Then we'll fly south to Luxor and visit Egypt’s greatest compound of temples, the Temple of Luxor and the Temples of Karnak. From here we start our adventure cruise on the Nile and will float the shining thread of Egypt for several days. Both adventure cruise trips stop in Aswan to visit the incomparable Valley of the Kings and other dramatic Egyptian sites. The cruise continues south to the ancient border between Egypt and the southern nation of the Nubians. It was here some 3,300 years ago that Ramses II carved the dramatic temples of Abu Simbel. Two of our yearly departures coincide with the twice-yearly "Miracle of the Sun." This is when the early morning sun illuminates the inner sanctuary, reaching the four statues carved around 211 feet from the temple's main entrance. We invite you to join ROW for an extraordinary adventure cruise through one of the world's richest histories. Our private Egyptologist guides us through Cairo to visit numerous sites. We start the tour with a visit to the site of Ancient Memphis which was the first capital for the United provinces of Egypt as early as 3100 BC. From there we will visit the site of Saqqarra which includes the Step Pyramid of the Pharaoh Zoser dating to approx 2800 BC, in addition to visiting the tombs of the nobles which belonged to the courtiers of the Pharaohs. This visit will allow us to learn about the development of the concept of burial in ancient Egypt and how the shape of the Pyramid was chosen for the burial grounds of the Pharaohs. After lunch in a local restaurant continue to the Pyramids of Giza. Egypt is home to over a 100 pyramids and no matter how much you have read about them or how many photos you've seen, nothing prepares you for the moment when first catch sight of the Pyramids at Giza in person. Here you will see The Great Pyramid built by the Pharaoh Cheops and dates to approx 2580 BC. It is the only surviving monument of the Ancient Wonders of the World. It contains approximately 2.3 million stones weighing between two-and-a-half tons to 14 tons each, and covers an area large enough to fit four city blocks and standing over 460 feet high. Also located in Giza you will find the famous Sphinx and many tombs in subsidiary pyramids built for the wives and sisters of the Pharaohs. In the morning we visit the Citadel of Salah El Dein dating back to the 12th century. Originally it was built to be military quarters for the rulers of Egypt and a base for protecting the borders of Cairo; however, by the 19th- century Mohamed Ali, one of the rulers of Egypt, built his palace here and also a mosque known as the Citadel Mosque or the mosque of Mohamed Ali. It is almost an exact copy of the Blue Mosque in Turkey. Next we visit the local market of Khan El Khalili. After a short lunch break we visit the Egyptian Museum of Antiquities that displays over 140,000 pieces in addition to the stored pieces it houses. The museum chronicles the history of the Old, Middle and New Kingdoms. With our own Egyptologist we are also able to visit the treasures of the child pharaoh Tutankhamen. Overnight Cairo. We take a morning flight to Luxor which is also known as Waset or Thebes. On arrival, we visit the Temple of Luxor and the Temples of Karnak, Egypt’s greatest compound of temples. The afternoon is free to explore on your own. Overnight Luxor. We rise early and travel to the West Bank of Luxor to the Valley of the Kings, where Howard Carter discovered the tomb of Tutankhamen in 1922. We walk to the tombs of the pharaohs. We also visit the tombs of the Noblemen and workers to understand the different styles of funerary art in Ancient Egypt. We will also get to visit the mortuary temple of Queen Hatshepsut. Finally we view the Colossi of Memnon. We have a special evening with a local family, giving us a chance to learn more about life in Luxor and Egypt today. Overnight Luxor. We make a morning visit to the temple of Edfu which was dedicated to one of the forms of the God Horus. It is one of the largest and best-preserved sandstone temples from Ancient Egypt dating as early as 237 BC and built by the Greeks. Then we board our Dahabia or “Golden Boat” so called because they were used by the royal families. In the 19th and 20th centuries many travelers sailed the Nile aboard these beauties. These shallow-draft boats allow us to navigate not only the main Nile but the many side channels, giving us access to some more remote and less-visited sites. Our Dahabia is the Dongola, which was originally built in England and started sailing the Nile in 1835. This was once the private yacht of Sultan Hussein Kamel who ruled Egypt from 1914 to 1917. The Dongola is 114 feet long and has five cabins with private bathrooms. It has an open air area with low level tables. She provides a truly romantic transport in this ageless land. We anchor at Fawaza Island for a beach barbecue and overnight. Each day reveals new treats and wonders. Today we visit El Ramadi village, Wadi el Chattb, then on to El Silsila where we find the remains of the ancient sandstone quarries and overnight onboard in front of the remains of the temple of Silsila. Today we enjoy a special visit to the not often visited temple of Horemheb, cut into the riverside rocks at Selsela and dating to the Middle Kingdom period, making it much older than many of the other sites that are more commonly visited. We also visit another ancient quarry which was the main quarry for many of the temples in the area. Further on we sail to the Temple of Kom Ombo perched on a high dune above the Nile, which was dedicated to both Sobek, the crocodile god, and Haroeris, known as Horus the Elder, and one of the forms of the God Horus. We continue sailing to Koubania Island for a special visit with the local villagers. We continue south, arriving at Aswan where we visit the Temple of Philae - center of the cult of the Goddess Isis. This magnificent temple is on the island of Agilka and has enticed visitors for centuries. We also see the famous and controversial Aswan High Dam completed in 1970. There is time later in the day for your choice of visiting the Nubian Museum or strolling through the vibrant outdoor market in town. Overnight on Dongola. We depart early from our yacht to cross the Nile to the West Bank to see several seldom-visited sites. As in days of old, we take a camel ride in the desert of Aswan to the Monastery of St. Simeon, the most important example of an oblong, domed Christian church in Egypt. The keep, or tower, which served as a permanent residential complex, is the most developed of its kind. After this visit, we continue on camels to the tombs of the Nobles that date back as early as 2600 BC and are located near the Mausoleum of the Agha Khan. After visiting the tombs and enjoying one of the most beautiful views of Aswan, we return by boat to the other side of the river for an early afternoon flight south to Abu Simbel. After lunch we explore the great rock-cut temple of Abu Simbel, carved out of solid rock on the bank of the Nile in the land of Nubia. They are among the most magnificent monuments in the world. When the temples were threatened by submersion in Lake Nasser, due to the construction of the Aswan High Dam, the Egyptian Government secured the support of UNESCO and launched a worldwide appeal to move them to higher ground. Their removal and reconstruction was an historic event in itself. We have a special treat this evening as we stay in a guest house owned and operated by a Nubian family. This peaceful place offers warm hospitality and a wonderful opportunity for cultural exchange. We have an early dinner and sound rest. At about 3:30 am we return to the temple to view a unique phenomenon called the Miracle of the Sun. This phenomenon takes place twice a year, on the 22nd of February and on the 22nd of October. In the early morning hours the sunlight enters the sanctuary to reach the four statues carved in there, thereby illuminating this deep, dark place in the rock that is 211’ from the temple's principal entrance. In the Great temple, through a hypostyle hall containing eight columns depicting Ramses II, is an inner sanctuary with statues of Ra, Ramses II, Amun and Ptah seated against the far wall. At the solstices, the dawn sunlight is aligned to light the entire length of the temple, lighting up three of the four statues, but never touching that of Ptah, the god of darkness. After witnessing this awe-inspiring event, we return to the guest house for breakfast, then on to the local airport for our flight back to Cairo. Check into our hotel and enjoy a farewell dinner. Transfer to airport for flight home, or continue to other Egypt extensions. 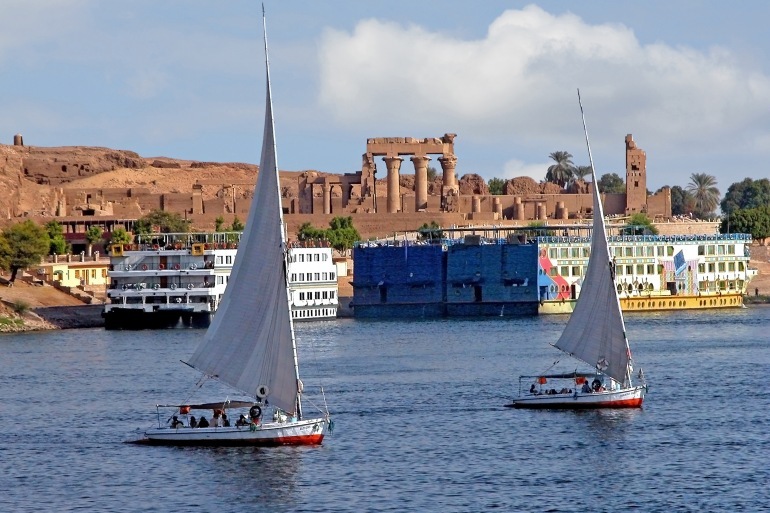 13-Day Adventure Cruise on the Nile Custom trips available for groups of 6 or more.